Litecoin leads the way as half of the top twenty see double-digit gains. Twitter CEO Jack Dorsey passes a lightning torch. The cryptocurrency market has been strong in the last week with half of the top twenty coins seeing double digit gains. 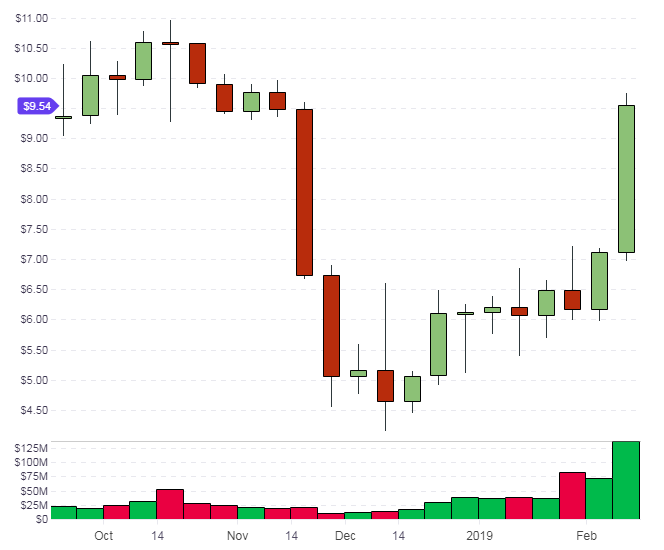 One of the biggest winners was Litecoin, which built on last week’s gains with another 31% move. The fourth-largest currency by market cap now has a value of $2.7bn but is still some distance from third-placed XRP’s $12bn. The move by LTC saw Bitcoin Cash and EOS ousted as the battle for supremacy continues. Litecoin has a coin supply which is 3.5x the supply of Bitcoin, so the valuation gap of $64bn to $2.7bn means that 1 Bitcoin is worth 82 Litecoins. It wouldn’t be surprising if we see big changes when the institutional money comes to the market. The old guard valuation system and paradigms may be shaken up and it will be therefore important to watch for the early stages of this if we do see some movement after March. Will professional investors see the 3.4 and 82 gap as a misrepresentation of the technologies or potential for the two coins? 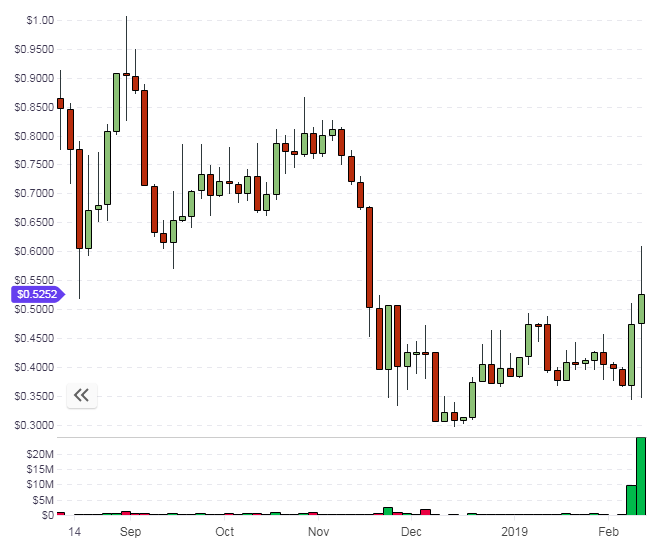 Another driver of the LTC price was the news that the Litecoin foundation and software developer Beam had decided to work together to explore the potential of LTC utilizing the “Mimblewimble” protocol to improve privacy and scalability. We have started exploration towards adding privacy and fungibility to Litecoin by allowing on-chain conversion of regular LTC into a Mimblewimble variant of LTC and vice versa. The implementation of the protocol would require a hard fork of LTC. Lee has previously mentioned in various conversations his interest and hesitation with MimbleWimble but had hoped that the community would adopt the change if it proved to be a worthwhile upgrade to the network. …we are still in a range created from the mid-December bounce. LTC may look to test $40.00 next and attempt to take the $50.00 level once more if the overall market can rally. LTC moved through that $40.00 level and did so without the help of a Bitcoin move so we may be seeing a change of dynamics in the market. The $50.00 level is key for LTC because it was a base for the rally to $400.00 in late 2017. Getting back above there again could confirm that we may have seen a long-term low. Binance Coin has been another strong gainer and out-performed LTC with a 38% gain on the week. Much of this move has been powered by demand for the BitTorrent token (BTT), which has seen a gain of 600% since its ICO. BitTorrent is a peer-to-peer platform that allows users to share files over the internet. The platform launched the Tron-based BTT token last month and managed to sell $7 million through the sale of 50 billion tokens in only 15 minutes. BNB currently trades around $9.50 and a test of the $10.00 mark is almost inevitable. If BNB can get hold this level then further gains are possible. BNB has an all-time high of $24.37, which was set just over a year ago on January 6th 2018 and the coin is tenth in the market cap list. Ark has produced a 27% gain for the last week, which has moved the ARK coin closer to 60th place in the coin list. …an entire ecosystem of linked chains and a virtual spiderweb of endless use-cases that make ARK highly flexible, adaptable, and scalable. The platform is designed for mass adoption and its 8 second block time is one of the fastest in the market. The developers align the design towards staying lean and fast to allow real scalability, which is a problem that many coins are trying to tackle. Looking at the roadmap for Ark shows 2019 as the scheduled completion date for ARKCM smart contracts and interestingly, there is development being done on contactless chips and wearable devices, alongside point of sale (POS) hardware. The speed and scalability could make this one a coin to watch and the introduction of cryptocurrency payments through wearable technology could be big. ARK trades above the $0.50 level after bouncing off the $0.60 September lows. This will be resistance and getting above that level would open up the market to the $0.80 and $1.00 levels. ARK’s 140 million total supply is not as restrictive as many of the coins with supplies in the billions. This should help with valuation going forward. An interesting development last week was the involvement of Twitter CEO Jack Dorsey in a cryptocurrency “lightning torch” payment chain. The torch was started by an anonymous Twitter handle and saw 10,000 Satoshis added by each party. Dorsey then referenced a tweet which suggested using crypto as a reward for tweets which saw the Twitter founder stating that he loved the idea. With Facebook reportedly working on their own currency, the worlds of cryptocurrency and social media may soon collide in a revolutionary collaboration that reinvigorates a desire to contribute to the platforms through a rewards-based business model. Dorsey recently stated that Bitcoin is the only currency he owns. The cryptocurrency market has been strong this week and investors should pay attention to the fact that Bitcoin is stagnating, whilst other coins are powering higher. Although BTC would do well in a market rally, it may be outperformed by others and we could see some changes in the current valuation gaps between the number one cryptocurrency and its peers. Disclaimer: information contained herein is provided without considering your personal circumstances, therefore should not be construed as financial advice, investment recommendation or an offer of, or solicitation for, any transactions in cryptocurrencies. fresh, FREE, and delivered directly to their inbox. We value your privacy, your email address is safe with us. Ripple (XRP) – The Strong Bearish Momentum Remains Intact, Will The Channel Break?